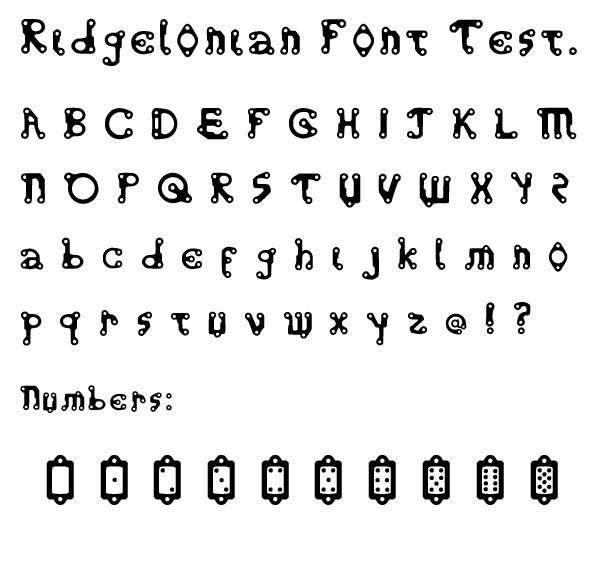 I have become obsessed with making a font for every civilization or alien species in my comic, so here is a font I made for the Ridgelonians. Since they have engineering minds I wanted to give them letters that look like gaskets and printed circuits. Same as early Earth scripts were shaped like birds and plants they used in their everyday life, Ridgelonians would design their writing after mechanical parts. But of course, the text has to be understandable for the reader, so the letters has to be recognizable as English text. But doesn't that ruin the whole point of making an alien language? Now after I made the numbers I realize I drew Berenjilda with four fingers in each hand. Humans have a decimal system because we started using our fingers to count. So Ridgelonians are supposed to have a numeric system based on the number 8. Anyways, I don't even know what use this will have in the comic, probably only if I want to show some text on her computer's screen.